When the toughest Bassmaster Classic in history played out on Pittsburgh's Three Rivers in 2005, their hardened faces got as much TV time as eventual winner Kevin VanDam. You know them well. You can't miss them. They span hundreds of yards, if not miles, over your favorite body of water, and hang dozens of feet over your head. Lake Shasta, California's I-5 Memorial Bridge, Grand Lake, Oklahoma's Sailboat Bridge, Table Rock, Missouri's Shell Knob Bridge, Guntersville, Alabama's B.B. Comer Bridge and Buggs Island, Virginia's Clarksville Bridge represent just a handful of the famous ones. 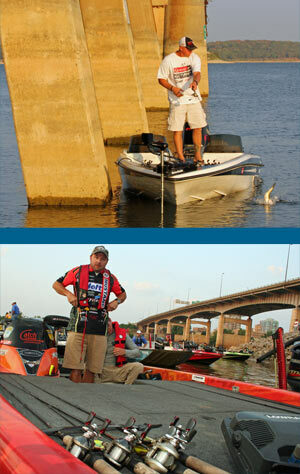 Still, bass fishing's famous bridges are like a homecoming queen with a highly arrogant demeanor. They're of a striking physical presence, yet most of us choose to steer clear of them. Mike McClelland is honest to a fault, and he's quick to admit that he too often turns a cold shoulder to bass fishing's most obvious structure. "It's kind of funny, I know the power of bridge piers, still, I'm one that too often overlooks them. I don't fish them nearly as often as I should," confesses the career-long Quantum pro. "Bridges offer all the things bass love," said McClelland. "Generally they have as much or more current around them as any portion of the lake. They create a funnel for baitfish, and generally you'll find major depth changes near bridges. Plus, the one thing they consistently offer in the warmer months is a lot of shade lines for the bass to ambush prey from," explains McClelland. When asked for just one key piece of advice for fishing these can't miss structures, McClelland offered this. "Typically, bass that live near bridge piers are suspended. They're not on the bottom, and they're not surface oriented. So I use spinning tackle for finesse presentations to catch them, but I also use baitcasting equipment for lures like my McStick jerkbait to catch them around the piers too." As a construction supervisor for Solitaire Homes in southern Oklahoma, Robert Henderson knows a lot about manmade structure, and he's fast to back-up McClelland's claim about bridge-oriented bass typically being suspended. "It's really key to stay in touch with your line as it's falling down the side of the pier, because nearly every bite will occur from bass that are suspended as your lure is sinking through the water column," said the BoatU.S. Angler member from Lake Texoma. "I use spinning tackle, and I peel off line as my shaky head or drop-shot is sinking. I'm careful not to let the line get too slack, but I want it to fall fairly deep until a suspended bass decides to pick it off," concludes Henderson, MVP of the Bass Zone's 2010 Fish & Chips Pro-Am tournament. Speaking of spinning tackle, living legend Shaw Grigsby won't claim to be a bridge pier expert, but he is fast to acknowledge their goodness. "There's not a bad time of the year to fish bridges," said Grigsby. "They're like the pinch points or funnels we talk about in deer hunting. They're travel routes where creatures congregate because of abundant nearby food and security cover." "There have been plenty of times when bridge piers have produced the one or two critical bites that got me a paycheck," reflected Grigsby, who favors what he describes as an "amazingly light" Quantum EXO spinning reel, paired with his 6' 10" Tour Grigsby spinning rod for 'pier fishing.' "That reel is so light that you're able to feel anything that breathes on your lure as it's falling through the water. And that rod is built with a parabolic blank so it's forgiving enough not to stress and break the 6 or 8-pound test line I typically use," explained Grigsby. Perhaps nothing offers greater testimony as to the productivity of the often-ignored structures than McClelland echoing Grigsby's sentiments about the payday potential of these concrete piers. "Thank goodness, it seems like a lot of the best bridges are near weigh-in locations. 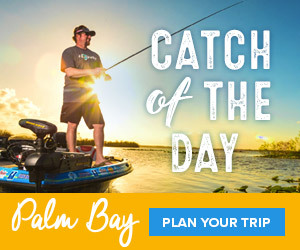 Because I can't tell you how many times I've made one last stop before weigh-in at a bridge pier and caught the key fish that saved my day," concluded McClelland.